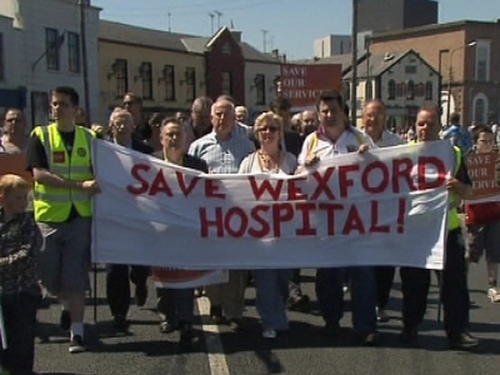 Around 4,000 people attended a protest in Wexford town this afternoon about the future of Wexford General Hospital. This protest was organised by a coalition of groups and hospital workers in Wexford over what they see as attempts to downgrade services at Wexford General hospital or at some stage to reduce the number of hours the accident and emergency unit is open there - it is currently a 24 hour service. The Health Service Executive has confirmed it has received approval to progress with plans for an extension of the emergency department and refurbishment of maternity facilities at the hospital. A design team has already been appointed to work on the project and the HSE has allocated €200,000 for further preparations of plans this year. Richard Dooley, the HSE's Hospital Network Manager for the southeast, said: ‘These envisaged additional facilities are required. 'Wexford General Hospital plays an important part in the HSE South East hospital network and there are no plans to lessen its importance in the provision of services’. He said that the HSE is reviewing the current configuration of acute hospital services in the region and a steering group is developing a plan that will ‘deliver optimal and cost-effective services that are easily and readily accessible’. He added that no decisions on the roles of hospitals or services will be taken until the plan is completed, which is expected to be later this year.